What Is Killing Portugal's Octopuses? What is killing the octopus of Vila Nova de Gaia? That question has obsessed the Portuguese city  located just across the Douro River from Porto  since Jan. 2, when 1,100 lb. (500 kg) of dead octopus were found on a 1.8-mile (3 km) stretch of local beach. The following day, another 110 lb. (50 kg) appeared; later there was just one expired creature. "It's very strange that so many should be killed, and in such a confined area," says Nuno Oliveira, director of the Gaia Biological Park, a nature refuge on the outskirts of Vila Nova de Gaia. "There's nothing in the scientific literature for this kind of mass mortality among octopus." Twelve hundred pounds is a lot of dead cephalopod, especially when no one seems to know for sure what killed them. Local biologists have ruled out pollution or contamination because no other species were affected. And although some suggest that perhaps a boat, illegally fishing the multilegged creatures, threw them overboard in a panicked attempt to avoid detection, that possibility also seems unlikely. "The sea has been very rough," says Oliveira. "No one has been out fishing for days." After issuing multiple warnings that no townspeople should take the carcasses home for dinner (boiled octopus  perhaps sprinkled with a touch of paprika  is a Portuguese delicacy), Vila Nova de Gaia's municipal government had firefighters gather up the dead animals; many will be sent to Lisbon's veterinary lab for testing, a process that is expected to take up to two weeks. Until then, evidence points to some sort of disease: a parasite, bacteria or powerful virus. "It affected octopus of all ages and sizes," says Mike Weber, director of the Aguda coastal station, an aquarium and biological research institute in Gaia. "That suggests that it wiped out the entire local population." There is one other option. 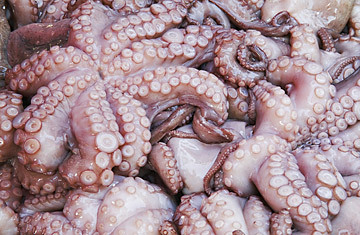 In December 2007, Portuguese police confiscated 9.4 tons of cocaine in a shipment of frozen octopus from Venezuela. "I suppose it's possible that someone defrosted the animals, took out the cocaine, then threw their bodies overboard," says Weber. Still, like Oliveira, Weber is betting on a biological cause. "We've had swine flu, bird flu," he says, not completely in jest. "Why not octopus flu?" See the top 10 animal stories of 2009.